For the last two years we've been the largest Nut Wizard dealer in the country. There's good reason for that. We keep a large inventory of Nut Wizard's in stock so we can ship same day. Our volume buying power means we can sell to you for less. Furthermore, our easy return policy gives people confidence to try them out. 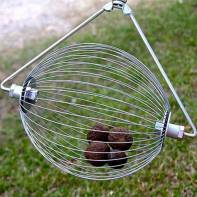 The Large Nut Wizard is designed to pick up black walnuts, and small sweet gumballs. Many people use it to pick up apple and pear-sized fruit. Don't worry if you get the wrong size, we'll shop out the cage with you at our expense. The 17" Nut Wizard picks up nuts, seeds, fruits, or balls between 1" and 4" in diameter; we recommend it for black walnuts, sweet gum balls, apples, oranges, lemons, citrus fruits, hedge apples, (osage-orange tree), some pine cones, and magnolia seed/flower heads.